Add brightness and color to any classroom. This sturdy table features a solid maple base with bolt-reinforced mortise and tenon joints for long-lasting strength. 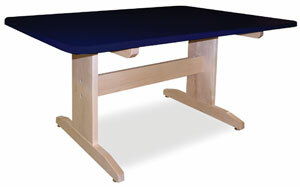 Heavy base components and wide feet fitted with adjustable floor glides make it very stable.